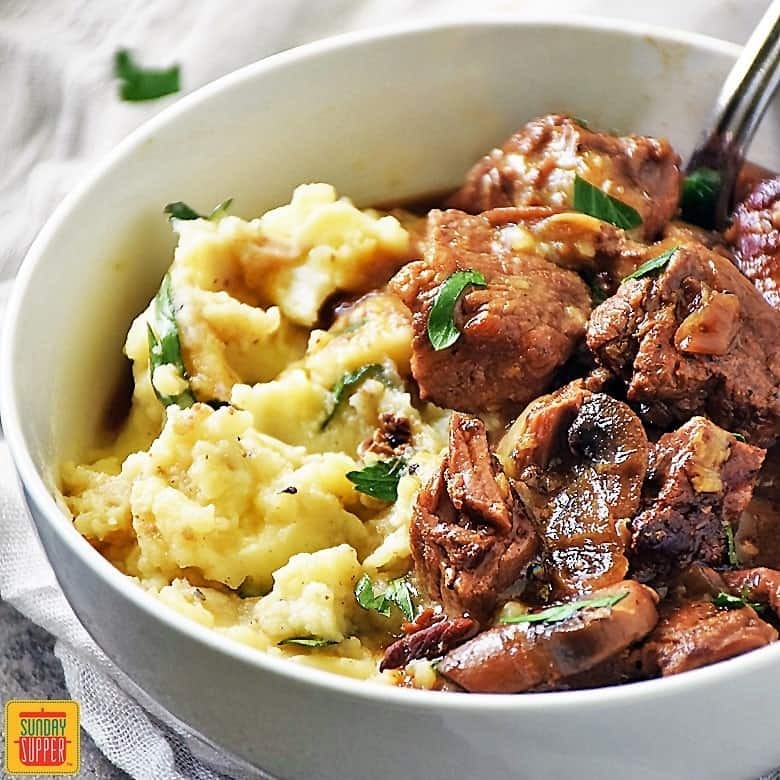 Slow Cooker Beef Tips and Gravy is an easy recipe that is super comforting and flavorful. It is perfect anytime, but we especially love it when the weather starts to change and we start craving comfort food. This recipe makes you feel all warm and cozy like snuggling up under a fluffy blanket next to a fire. It is, without a doubt, one of our faves in our collection of Slow Cooker Comfort Food Recipes. The definition of comfort food is likely different for most everyone, but I say if it gives you comfort then that’s comfort food! After a long day we all deserve a little comfort for dinner, amIright? The only problem with that idyllic thought is having to come home and actually make dinner! The solution is slow cooker recipes. 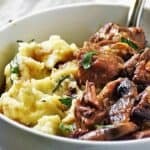 With slow cooker recipes you can prep it the night before, in many cases, and just plug it in the next day at breakfast or, if you are a morning person, you can prep it all in the morning before heading out the door. 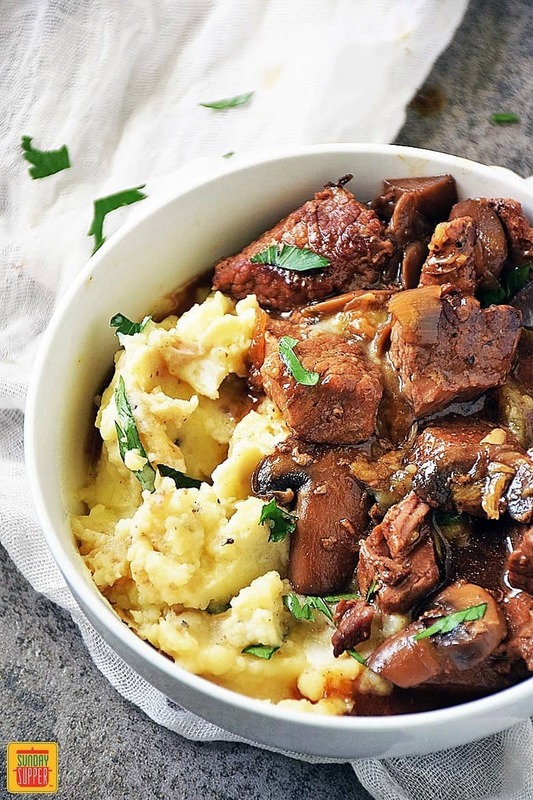 Either way, you get to walk in the door in the evening to a wonderful aroma wafting through your home and, with just a little effort, sit down to a delicious, comforting meal like our Slow Cooker Beef Tips and Gravy. 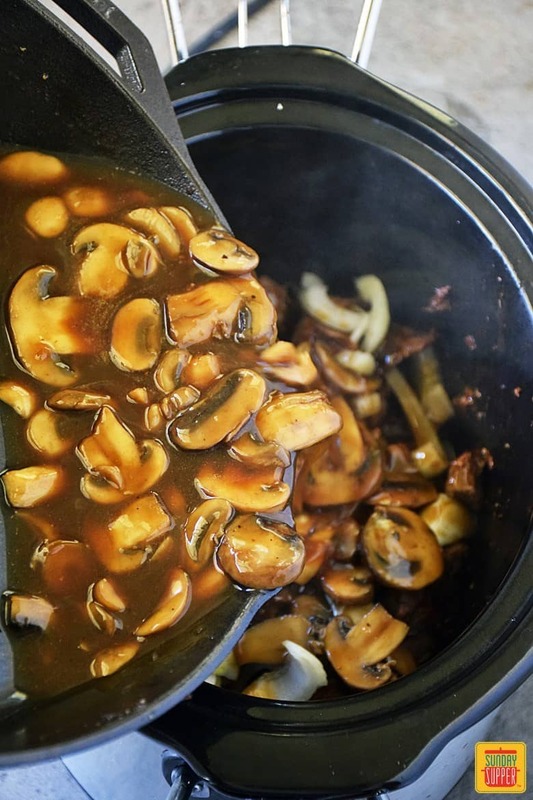 Sauteing the mushrooms for the gravy prior to adding to the slow cooker brings out the savory mushroom flavor and is also key for maximum results. 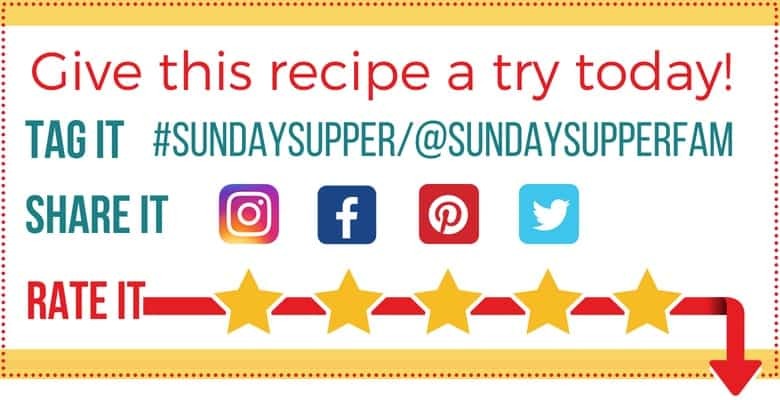 We recommend using a beef base/water combination in this recipe. You can find beef base in the soup aisle of your grocery store. 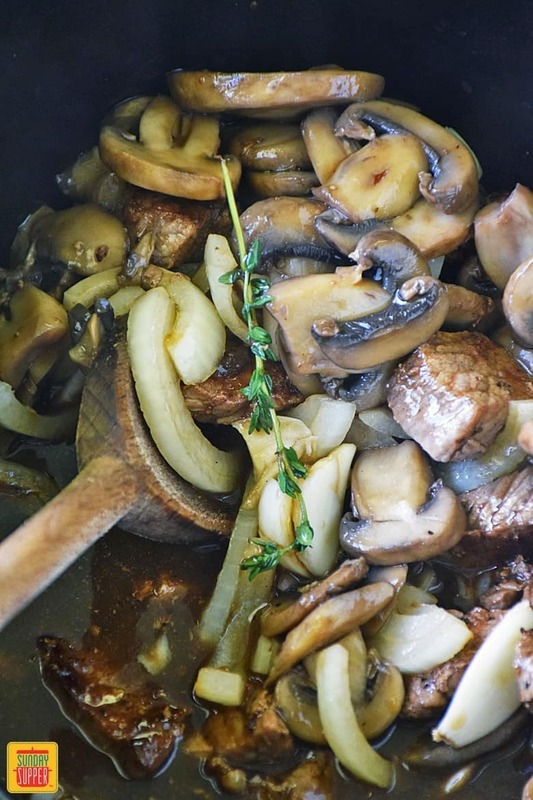 Beef base will give the gravy a deep rich flavor, however, you can also substitute 1 1/2 cups beef stock in place of the water/beef base combination. Be sure to use beef stock (not broth) for maximum flavor results. Adding the thickener at the end allows us to elevate the flavor of the gravy with a hint of red wine. It really makes a difference in the overall results. Adding the red wine/cornstarch mixture to the slow cooker and cooking on high for about 20 minutes should thicken the gravy nicely. I like to do this as I prepare the mashed potatoes. If you’d rather thicken the gravy more quickly, just pour it into a sauce pan and add the red wine/cornstarch mixture, bring to a boil, and simmer for about a minute or two. Season beef tips with 1 teaspoon kosher salt and 1/2 teaspoon freshly cracked black pepper. Melt 1 tablespoon butter in a skillet over mid-high heat and add the seasoned beef tips to the hot skillet. Allow the beef to sear about 4 minutes on each side. You want a nice caramelized coating on the beef. Place seared beef tips in slow cooker and top with 1 cup of sliced yellow onions. Add about 5-6 whole garlic cloves (peeled), along with a sprig of fresh thyme. Reduce the heat of the skillet to medium and melt 1/2 tablespoon of butter. Add the sliced mushrooms to the skillet with a pinch of salt and stir to coat in the butter. Saute for about 5 minutes until the mushrooms soften and start to release their juices (sweat). Stir occasionally scraping the brown bits from the bottom of the pan. Add 1 1/2 cups water and 1/2 tablespoon beef base to the skillet and stir to combine. Add this mixture to the slow cooker with the beef tips. Cover the slow cooker. Cook on low for 5 hours or high for 2 1/2 hours until the beef is fork tender. You want the beef to melt in your mouth, so cook longer if needed. Once the beef is tender, combine 1 tablespoon red wine with 1 tablespoon cornstarch and add to the slow cooker. Turn heat up to high and cook about 20 minutes until the gravy is thickened. Alternately, add the gravy to a skillet over medium heat with the cornstarch/red wine mixture. Heat until thickened which will only take a minute or two. Serve over mashed potatoes and enjoy! 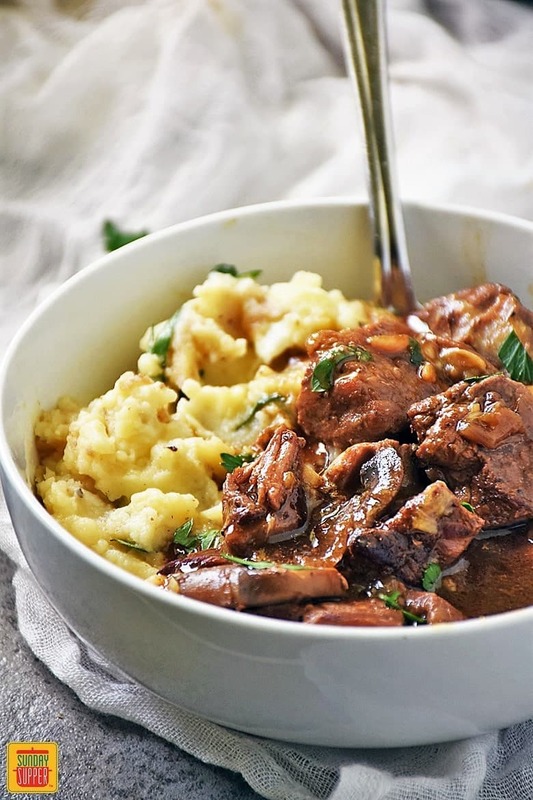 Slow Cooker Beef Tips and Gravy is an easy recipe that is super comforting and flavorful. It is perfect anytime, but we especially love it when the weather starts to change and we start craving comfort food that makes you feel all warm and cozy like snuggling up under a fluffy blanket next to a fire. Season beef tips with 1 teaspoon kosher salt and 1/2 teaspoon freshly cracked black pepper. Melt 1 tablespoon butter in a skillet over mid-high heat and add the seasoned beef tips to the hot skillet. Allow the beef to sear about 4 minutes on each side. You want a nice caramelized coating on the beef. 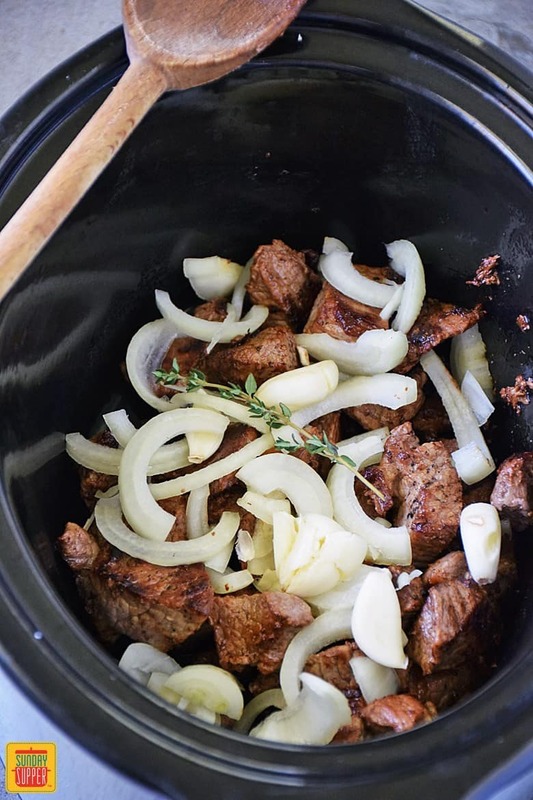 Place seared beef tips in the slow cooker and top with 1 cup of sliced yellow onions and about 5-6 whole garlic cloves (peeled), along with a sprig of fresh thyme. Reduce the heat of the skillet to medium and melt 1/2 tablespoon of butter. Add the sliced mushrooms to the skillet with a pinch of salt and stir to coat in the butter. Saute for about 5 minutes until the mushrooms soften and start to release their juices (sweat). Stir occasionally scraping the brown bits from the bottom of the pan. Add 1 1/2 cups water and 1/2 tablepoons beef base to the skillet and stir to combine. 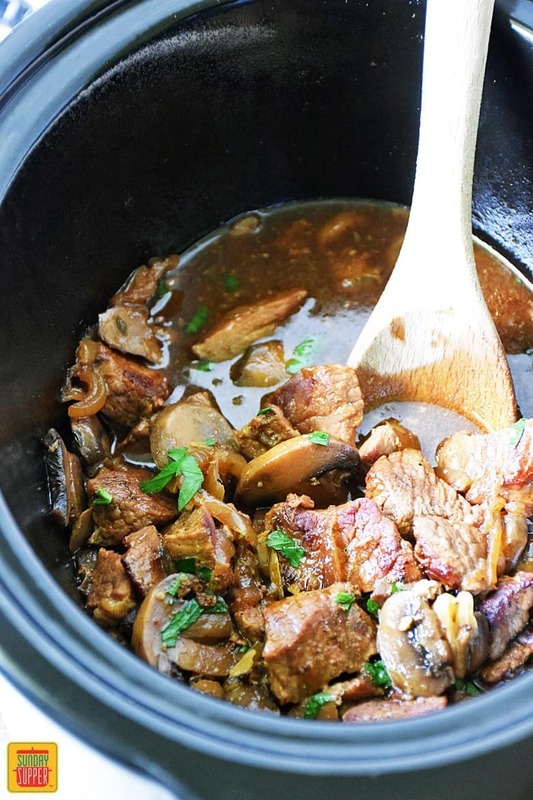 Add this mixture to the slow cooker with the beef tips. Cover the slow cooker and cook on low for about 5 hours or on high for about 2 1/2 hours until the beef is fork tender. You want the beef to melt in your mouth, so cook longer if needed. Once the beef is tender, combine 1 tablespoon red wine with 1 tablespoon cornstarch and add to the slow cooker. Turn heat up to high and cook about 20 minutes until the gravy is thickened. Alternately, you can add the gravy to a skillet over medium heat and add the cornstarch/red wine mixture to the gravy and heat until thickened which will only take a minute or two. That gravy looks fantastic! Yum! I’ve never made beef tips but these looks scrumptious!